Islanders in the Inner Hebrides have told of their concerns about the lifeline air service they rely on. Argyll and Bute Council has had to re-tender its public obligation service (PSO) flights between Oban and the islands of Colonsay, Coll and Tiree. The situation arose in February because the council said the price from the only bidder, Hebridean Air Service, exceeded a new, lower contract ceiling. Islanders fear there will be a gap in provision during the tendering process. The flights are used by children to get to school on the mainland and by visiting health professionals. Alison Jones uses the service once a week so her son Harris, the only four-year-old on Coll, can be educated with other children the same age as him. Secondary school pupils also use the service to get to and from high school in Oban. Alison said: "It's absolutely vital for us. This is the school bus. "You can do 50 miles in 30 minutes compared to a ferry in almost three hours." Jill Rae, practice manager at Coll Medical Practice, said the flights were frequently used by medical staff not readily available on the island. She said: "We have physiotherapists, podiatrists, health workers and midwives who come over and they can do it for the day, but cannot stay overnight. That service, I fear, we would lose." Paula Smalley, of Coll's community council, said she could not remember a time when the community had felt so exposed. The island has already lost its dentist service, no longer has a dedicated nurse and young adults have been leaving the isle. Paula said: "We are as a community extremely concerned about the future of our island. "When you have no youngsters there is no future and with this constant erosion of services it's not very encouraging." Argyll and Bute Council said it recognised the importance of the islands air service. 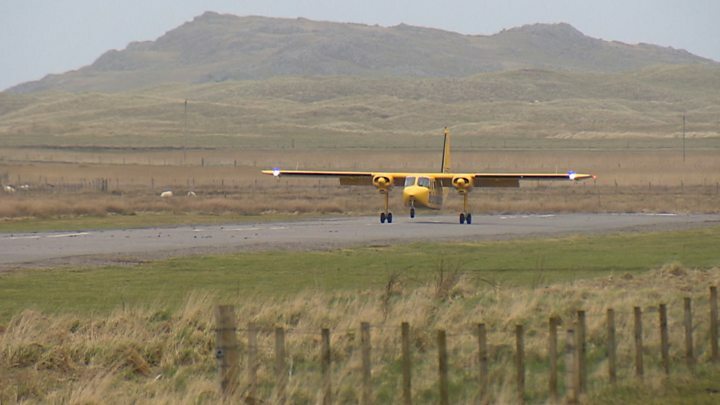 A spokeswoman said: "The contract for the vital air services from Oban to the islands of Tiree, Coll and Colonsay is out to tender and we remain committed to working towards a solution." In February, a spokesman from Hebridean Air Services said: "For the avoidance of any doubt Hebridean Air Services tendered for the renewal of this service from 16 May 2019 onwards. "We were advised that the procurement process was abandoned on the grounds that the bids received exceeded the funds that Argyll and Bute Council has assigned to operate the service. "We are continuing to have a dialogue with Argyll and Bute Council and sincerely hope that an agreement can be reached which means services are not disrupted."